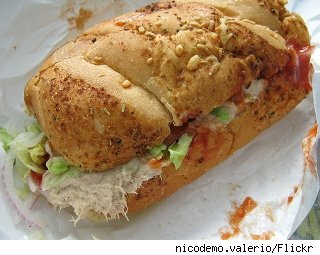 Get a free 6-inch sandwich from Subway when you buy another 6-incher and a fountain drink. Start here. Note, the page takes a few minutes to load so give it plenty of time. Basically, you play a sandwich-building game, picking a meat, cheese, and condiments. You name your creation and at the end get the coupon via e-mail. Not a bad trade if you regularly eat at Subway. I named my sandwich cheesy spicy chicken because it has two cheeses, roasted chicken breast, salt, pepper and red onions. Tasty! Unclear when the offer expires.